At Growing Earth Tree Care, we have your homestead’s needs in mind. With the season’s change comes holidays. And with holidays come traditions. One of our favorite traditions is seeing Christmas lights adorning the homes of our local communities including Vienna, Springfield, Reston, McLean, Great Falls, Fairfax, Falls Church, Alexandria, Arlington, Ashburn, and more. We are proud to be Northern Virginia’s top professional tree care company, providing both residential and commercial tree care services. Our services include tree removal, pest control, soil and root care, and tree pruning, among others. In the past, we’ve provided some (hopefully) helpful tips about how to plant trees and care for them once they are in the ground. 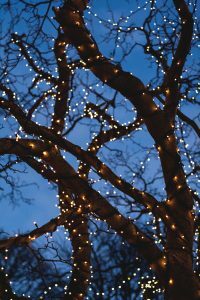 In light of the holidays being just around the corner, we thought it would be fun to depart from our usual topics in favor of some tips about hanging Christmas lights in your yard and on your house. If you’ve ever hung Christmas lights on your trees or home before, you know that things tend to go more smoothly if you have a plan before you climb up that ladder. Perhaps your inspiration came from online or a neighbor’s house down the road. To get started take a picture of your home from down the street to gain some perspective. Consider elements of your home like posts, doors, windows, trees, pillars, and eaves. You want to highlight the architectural features of your own home with lights. If you are really going for it this year, you can also take into consideration bushes, window boxes, planters, footpaths, and anything else outside the house. Additionally, it’s a good idea to have a focal point of your decorations. Whether it’s a nativity scene, a monstrous pine in your front yard, or the beautiful columns in front of your house, chose an element you prefer to highlight before you start flinging some lights up. Another thing worth consideration is the surface on which you will be laying your lights. If you are planning on hanging lights on your gutter, check their thickness in addition to the flexibility of your shingles. Mike Marlow, of the national company Holiday Bright Lights, says, “Everyone gravitates toward the roofline and they forget to balance it with something below. It’s like interior design. You might have something on your room’s walls, but you need something on the shelves and the end tables too.” We wholeheartedly agree with that advice. And, while we are talking about balance, don’t forget about your backyard! Sure, it doesn’t get as many eyeballs on it, but it can add some harmony to your yard and really bring the whole ensemble together. Just something to think about! What, you thought the prep-work was done? We are just getting started! It’s like your dad used to (maybe) tell you; not preparing is preparing to fail. Next up is measuring. Here’s an easy tip that will go a long way: for every foot of lights, you’ll probably need 100 lights. For example, if you have a 6-foot tree, you’ll need right around 600 lights for it took look sufficiently festive, in our humble opinion. One last task before you start putting the lights up: plug them all in to make sure that they are working. You could even leave them on while you are hanging them (assuming you do so carefully), so you can a better picture of what the end-product will look like while are working! We’ve mentioned it before, but we can’t stress enough how important it is to be safe while installing your outdoor holiday lights. Make sure your ladder is sturdy and that you have a good base before climbing up there. It’s vital that you don’t install lights on a tree that is in contact with a power line. Like, seriously, don’t do that, man. Secure all of your lights with insulated holders, as it’s a big no-no to use nails or tacks. And finally, don’t go to bed without turning your lights off. Not sure you’ll remember? That’s why timers exist so you don’t have to! After all, you should be making rather merry instead of worrying about fire hazards this holiday season. Did we say the word “finally”? We lied, but being safe during every step is part of this process. When selecting the power outlet to use, it’s a good idea to use a ground fault circuit interrupter (GFCI) outlet. This choice will benefit you in case of overcurrent because it will just shuts the whole system down. If you aren’t sure if your home is equipped with a GFCI outlet it’s an an easy fix. Your electrician can install one or you can get an outdoor, portable outlet for about $20! When you are setting out your lights and checking to see if they still work, make sure that the cords aren’t damaged or frayed at all. You can’t afford to have even one dysfunctional strand. In reference to the kind of light you are using, keep in mind that not all white lights are guaranteed to look alike. For example, LEDs will have a different hue than incandescent bulbs, which can appear orangish. That is certainly something to consider when mapping out your master plan. You also want to think about how you are grouping your light-types in order to create a more uniform, intentional vibe. While we are mentioning it, LEDs represent great value among other light types because they don’t use very much energy, plus you don’t need to worry about them overheating! Don’t forget to use outdoor, waterproof lights. This means you’ll need to check if your lights are tagged with a “UL” or underwriters lab. This indicates your lights are up to the national standard set by, you guessed it, the American National Standards Institute. Lastly, make sure your extension cords are approved for outdoor use, just like your holiday lights. Start at the bottom of the tree you are attempting to decorate, stringing your lights around the tree (or through it) in any fashion you wish. We aren’t an advocate of having too much uniformity. Trite spirals and other obvious patterns have become cliche. A natural vibe is far superior, in our opinion. To create this effect, lay your lights out in various depths. A “dead zone” is where one string of lights is connected to a different one. The green plug is a bit of an eyesore, so make sure you push it into the branches to hide its hideousness. And there you have it! Of course, no two yards are alike. So you might have some of your own challenges to deal with that we didn’t address here. And while we may not be able to troubleshoot the problems with your yard in reference to hanging Christmas tree lights, we can certainly help you with any tree care needs you might have. If you are in need of a free estimate from Growing Earth Tree Care, you can get yours, today!